Swanton Morley Farms has been using a new crop weighing system installed to two of its trailers and can now accurately measure the yield from every field. Simon Brock, farm manager, Swanton Morley Farms, said: “It’s vital that we know how much each field is producing and how each crop variety is performing to inform our decision making. With this system, we have the precise weight of each field and we know exactly how much we have in our stores. 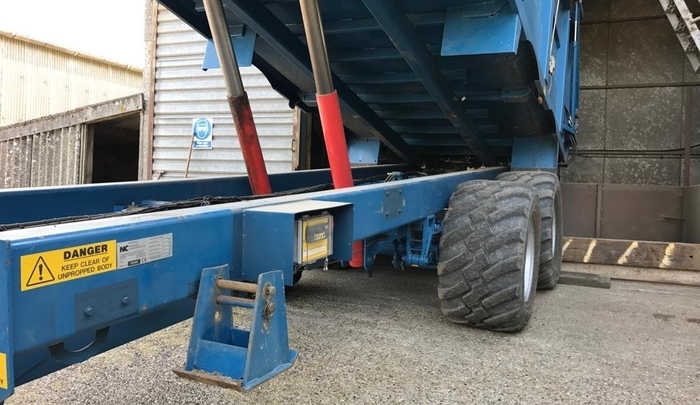 The trailer weighing system is manufactured by the UK’s market leader in vehicle onboard weighing and axle overload protection, Vehicle Weighing Solutions ltd (VWS). Shaun Hamilton, sales director, VWS: “Having a robust and accurate weighing system allows producers to know the precise yield for each field, immediately at the time of harvest. This saves time as the trailer no longer needs to return to the farm weigh-bridge each time. The ROCA load cell from VWS was originally designed for the waste management industry and is perfect for agricultural applications. It is extremely strong, lightweight and low profile, and has been tried and tested by farming contractors for over two years.